A lack of self-confidence often gets in the way of achieving dreams. And, let’s face it, negative thoughts and habits do, too. Energy leadership may be the answer to you finally living the life that you desire. Can’t you just hear Oprah begging you to live your best life? 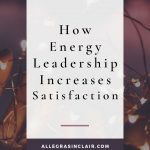 What is Energy Leadership and How Can It Help You? Energy leadership is the process of developing your leadership style. It supports you in creating positive changes in your life and the people that you interact with. In a nutshell, it’s a way of transforming the way you think and communicate with others so that you are inspiring, encouraging, supportive, and motivating to yourself first and foremost – and then to the people in your personal and professional life. What About that “Leadership” Word? Did you just think to yourself, “I’m not a leader, why would I want to improve my leadership skills?” You are a leader. Leadership is how you interact with everyone. You have an impact on the people around you whether you like it or not. Energy leadership helps you become aware of that impact and to embrace a positive and productive outlook. It’s about shifting your life from daily worries, fears, complaints, and problems to a life where you focus on solutions, productivity, happiness, passion, and success. When you change your thoughts and your beliefs, and begin believing in yourself and the skills and strengths of those around you, your relationships and your career become better. Changing your thoughts destroys frustration and makes your environment a much happier place to live in. How Does Energy Leadership Change Your Thoughts and Your Beliefs? Energy leadership begins with an assessment that shows you where you are right now and looks at the limiting thoughts and beliefs that are stopping you from being satisfied with your life. From there, with guidance from a certified practitioner, you’re able to begin questioning those beliefs that are holding you back, and adopting new beliefs that support you and make you feel more powerful. With this new awareness, you’ll begin to look at yourself and the world differently. Instead of being frustrated, you’ll feel motivated. Instead of overwhelm, fear, anger, and unfulfilled dreams, you’ll see a bright future and feel confident about pursuing it. You’ll also be in a position where you can positively influence and inspire those around you. Imagine being able to change your workplace and your relationships for the better simply by taking charge of your thoughts and beliefs. Energy Leadership is the fuel that drives you to take your life to a new level. Learning how you show up in the world will increase your leadership skills and influence. Get free tips on improving how you lead others.